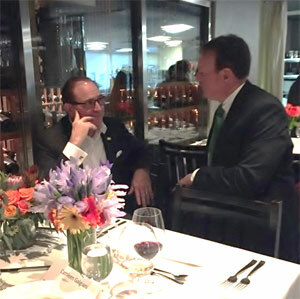 The Western Agricultural Processors Association hosted Assemblywoman Jacqui Irwin, Senator Cathleen Galgiani, and Senator Bob Huff as part of the Annual Agricultural Presidents Council (APC) "Kitchen Dinner" Event in Sacramento this past month. This event is a special "invitation only" event held at the "Kitchen Restaurant" in Sacramento for select members legislators and sponsored by members of the APC. The legislators have a sit down dinner with the hosting organizations in essentially a one-on-one format for the evening. Co-hosted by the agricultural organizations that make up the APC, this year's event attracted 25 legislators. Agricultural organizations co-hosting the event were the California Cotton Ginners and Growers Associations, California Citrus Mutual, California Fresh Fruit Association, California Rice Commission, California Strawberry Commission, Western Plant Health Association, Far West Equipment Dealers Association, and California Agricultural Aircraft Association. The events provide the Association and its leadership an opportunity to meet new legislators, as well as veteran ones, and educate them on the critical issues facing our industry. Attending on behalf of WAPA included Chairman Don Barton, President/CEO Roger Isom and Director of Technical Services Christopher McGlothlin. Each and every legislator received a special California Agriculture gift bag, which included almonds, walnuts, pistachios and pecans from the Association. These donations were made possible through generous donations from our members including walnuts from Gold River Orchards, pecans from Hamilton Ranches, pistachios from Horizon Nut and almonds from Paramount Farms.